Electric trams were a prominent presence in Adelaide from 1909 to 1958. The city centre was the focal point where the population congregated for work and leisure. 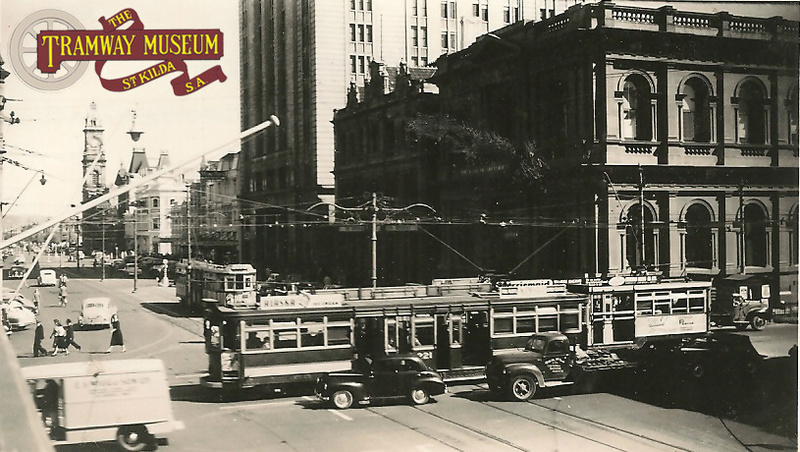 When electric trams were installed in Adelaide, seven major streets in the city area between the terraces had trams running through them. North Terrace (east and west). Grenfell/Currie Streets (east and west). Wakefield/Grote Streets (east and west). West Terrace (north and south). King William Street (north and south) - which was the main tramway artery. Pulteney/Hanson Streets (north and south). Hutt Street (to the south). These city streets served 21 suburban tram routes throughout the metropolitan area. A busy 1954 scene at the intersection of King William Street/Grenfell Street/Currie Street. Two 'Drop Centre' trams are crossing over King William Street bound for both the eastern and western suburbs while a third 'Drop Centre' waits for its' turn to cross the intersection bound for one of the northern suburbs. Trams would eventually return to this part of King William Street in 2007.